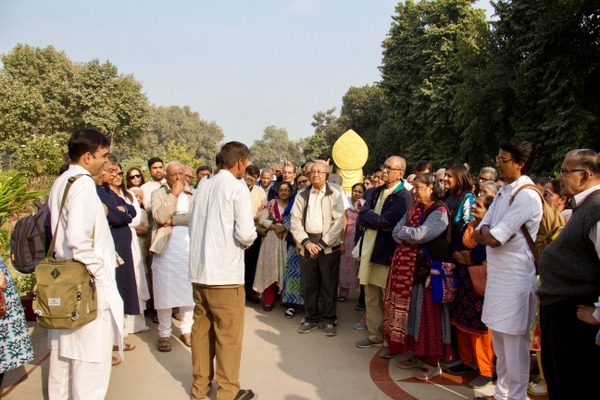 January 2019 Jatra (pilgrimage), took participating Raj Saubhag mumukshus to the Northern State of Uttar Pradesh, to the cities of Allahabad, Kaushambi, Varanasi, Ayodhya, Ratnapuri, Shravasthi and Lucknow, janma bhumi of 12 Tirthankars of current chovisi and their 48 Jin Kalyanak Tirths. 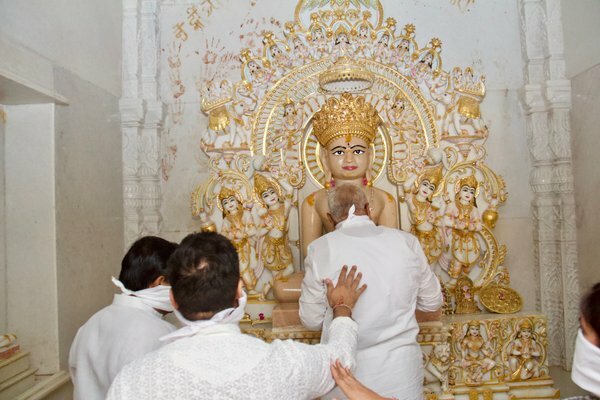 A land mass that holds utmost importance to Jain Mythology, where non-violence, peace and truth have been understood and practiced for thousands of years, where 17 of the 24 Tirthankars of current chovisi, were born and is home of 67 Jin Kalyanak Tirths. 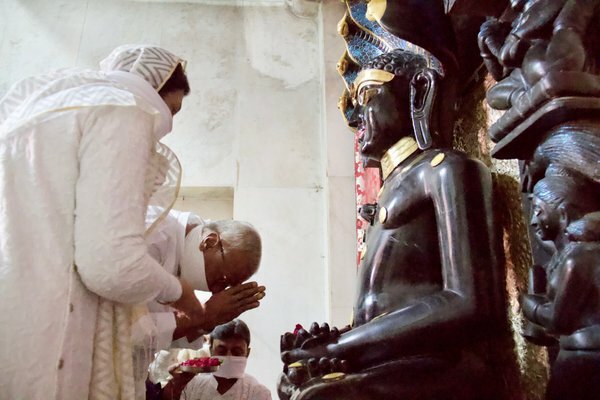 The innumerable Jain Shrines that dot the state of Uttar Pradesh speak of a myriad of intimate associations with the lives of Jain Tirthankars. A power-house of spiritual energy that has attracted and moulded sentiments of millions of people across the nation and around the world. Tirthankara, (Sanskrit: “Ford-maker”) also called Jina (“Victor”), in Jainism, a saviour who has succeeded in crossing over life’s stream of rebirths and has made a path for others to follow. 1. Chyavana Kalyanak: When the soul of Tirthankara enters mother's womb. 2. Janma Kalyanak: Birth of the Tirthankara. 3. 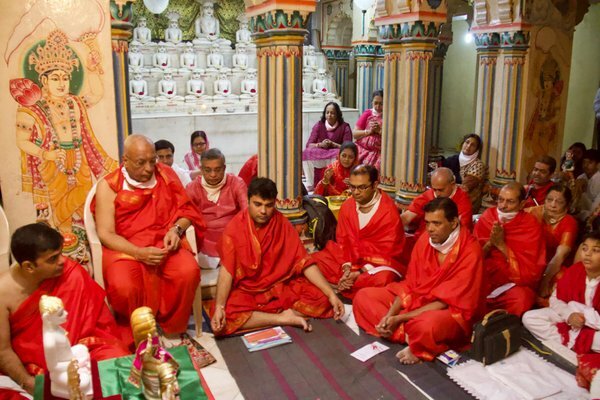 Diksha Kalyanak: When a Tirthankara renounces all worldly possessions and becomes an ascetic. 4. Kevalgnan Kalyanak: The event when a Tirthankara attains Kevalgnan, absolute knowledge. A divine samavasarana (preaching hall) appears, from where the Tirthankara delivers sermons. 5. Nirvana Kalyanak: When a Tirthankara leaves their mortal body, it is known as Nirvana, the final liberation, Moksha. Early morning start, 6:00AM, to visit Triveni Sangam. As mumukshus made way to the boats to reach holy Sangam, heavy fog obscured view of Kumbh Mela 2019 setup. Millions of tourists arrive annually for a sacred dip in the confluence of two physical rivers Ganga, Yamuna, and the subterranean mystical river, Saraswati. In Hindu mythology taking a bath in the holy Triveni Sangam is said to cleanse the soul of its sins, setting it free from the cycle of rebirth. The sight of the confluence of water of River Ganga (brownish) with Yamuna (slightly greenish), along with the flocks of chirping migrating Siberian birds flying over the boats, jostling for space for a holy dip, along with the pilgrims, is truly a mesmerising sight. Bhaishree likened the confluence of rivers to the sadhna he has blessed the mumuxus with. The origin of Kumbh Mela was transcribed by the 8th-century philosopher Shankara. The founding myth of the Kumbh Mela points to the Puranas (compilation of ancient Hindu legends). It recounts how heavenly angels and demons fought over the sacred pitcher, the Kumbh of Amrit, the nectar of immortality called the Ratna of Samudra Manthan. It is widely believed that Lord Vishnu, disguised as the enchantress ‘Mohini’ whisked the Kumbh out of the grasp of the covetous demons who had tried to claim it. 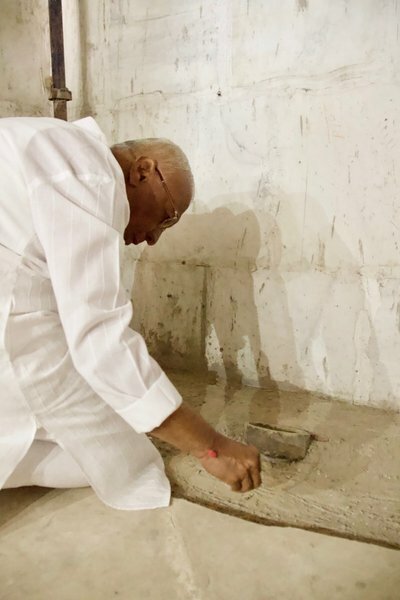 As he took it heavenwards, a few drops of the precious nectar fell on the four sacred sites which are now known as Haridwar, Ujjain, Nasik and Prayag. The fight and the following pursuit is said to have lasted twelve divine days which is equivalent to twelve human years and therefore, the Mela is celebrated every twelve years, staggered at each of the four sacred sites in this cycle. The corresponding rivers are believed to have turned into Amrit at the cosmic moment, giving pilgrims the chance to bathe in the essence of purity, auspiciousness and immortality. Once again, we can liken the fight of devas and asuras as that of Arhat conquering the four inner enemies to attain the inner nectar or the eternal bliss. Post breakfast, Yatris departed for Kaushambi Tirth, home of Padmaprabhu Swami’s 4 kalyanaks (chyavan, janma, diksha and kevalgnan). Immersed in bhakti bhaav, mumukshus had opportunity to do puja and chaityavandan with Pujya Bhaishree. Next, the Sangh headed to Prabhashgiri tirth - Pabhosa, for darshan at Digambar Derasar built in 1834 with mulnayak, Padmaprabhu Swami. Digambars believe Padmaprabhu attained diksha & Kevalgnan here. 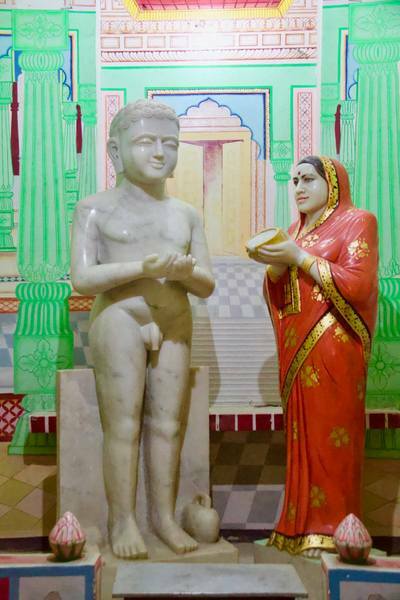 There is also a life size idol of Chandanbala giving alms to Bhagwan Mahavir. Chandanbala was enslaved and taken to Kaushambhi. After facing several trials and tribulations with equanimity and forgiveness, she was freed when Mahavir Bhagwan accepted alms from her. Prabhash giri, small hill, near the Digambar temple has a cave (9ft by 7ft) and a small Derasar. Padmaprabhu is said to have spent large part of his life in the cave. 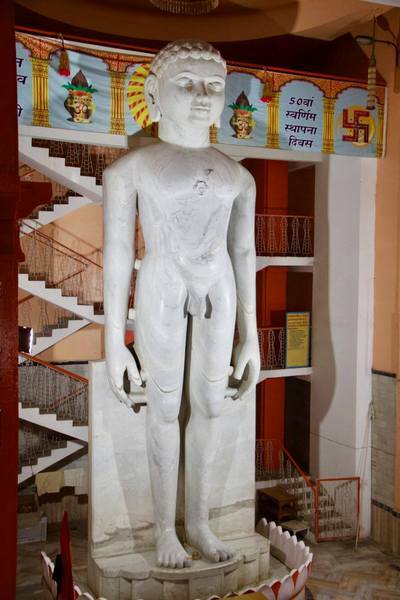 Bhagwan Mahavir had also visited Kaushambi many times, His samavarsan was also setup here. 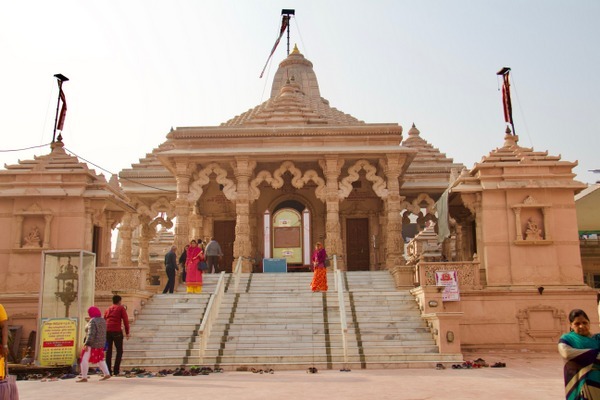 Legend also has it, Shri Krishna and Balram visited gardens of Kaushambi (Pabhosh) after the burning of Dwarka. It was here Lord Krishna, resting beneath a tree was mistaken as a deer and fatally wounded by the arrow of his brother Jarakumar. Sprawling city along the banks of River Ganges, Varanasi dates back to 11th century B.C., one of world's oldest inhabited cities with a maze of narrow alleys leading to its 88 ghats. 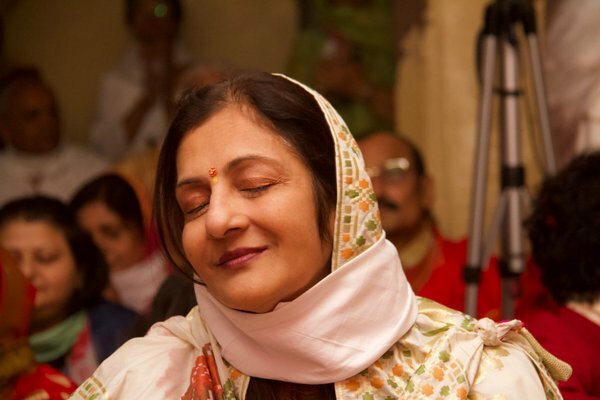 A unique symbiotic relation exists between its diverse culture & heritage, spirituality and rituals, new and classical, all coexisting in sublime harmony. 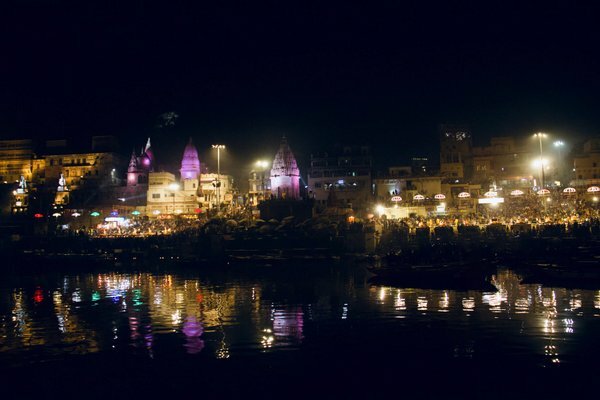 For Hindus, Kashi is ultimate pilgrimage point, to wash away sins in the sacred waters of Ganga, to cremate loved ones, or to simply die here, in order to fast track journey to moksha. 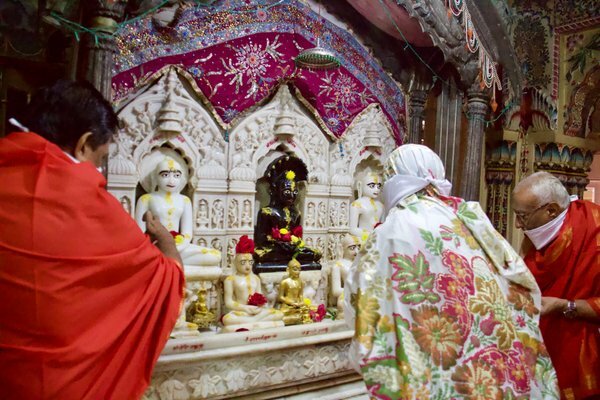 Along with Hinduism, this city of lights, is a magnet for Jains and Buddhists. 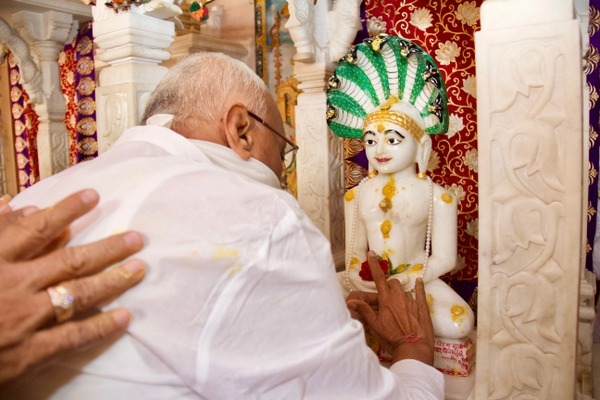 For Jains, Varanasi is a home for 16 Jin Kalyanak, 4 kalyanak each (Chyavan, Janma, Diksha & Kevalgnan) for Bhagwan Parshvanath, Suparshvnath, Chandraprabhu and Shreyansnath, respectively. Ancient temple of Chintamani Parshwanath, over 2,500 years old temple, built over three floors. Mumukhsus had opportunity to do seva puja and darshan of the several prachin murtis before settling down for Parshva Padmavati pujan. 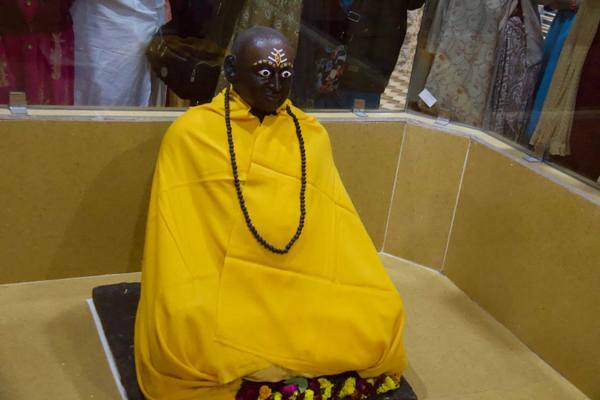 On the ground floor of the temple, a beautiful idol of Lord Parshwanath atop Padmavati Devi has been installed, at the Kamath Yagna Sthal, the very spot where the first interaction between Kamath and Bhagwan Parshwanath occurred. Legend goes, once Prince Parshva, passing by this area, witnessed a mendicant named Kamath conducting yagna outside the city. Coming closer to yagna sthal, the Lord noticed some logs of wood burning around the mendicant. Inside one of these logs was a pair of serpents, writhing in pain from the intense heat of the flames. Overcome by compassion the prince requested the mendicant to remove the log, "Burning a five sensed being in fire, what sort of self improvement do you strive for?" To that the mendicant replied angrily, "Prince! You are a child; go and enjoy your princely games. It is mendicants like me who know about religion not you." When all efforts to persuade him were in vain, Parshva ordered his attendants to pull out the particular log from fire and split it open. As soon as the attendants did that, a pair of partially scorched serpents, fell on the ground writhing in pain. Realising that they were about to die, Prince Parshva asked them to remain equanimous during the last moments of their lives and not to have hatred towards the ignorant mendicant. He then recited the Namokar Mantra. 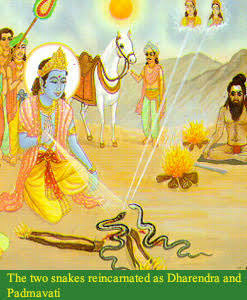 With equanimous bhaav and hearing the Namokar Mantra in their final moment, the pair of serpents, after death were born in heaven as the king and queen of the Nag Kumar clan (Dharanendra and Padmavati - yaksh & yakshini of Prabhu Parshvanath). Mumukhsus settled for an uplifting Parshva Padmavati pujan lasting about 3 hours. The pujan was led by Bhaishree, comprising of mantras, stuti & prayers officiated by Hiteshbhai, and augmented by soulful bhakti rendered by Deepbhai. The power of the mantras with mind gripping bhakti and aatma bhav of the devotees, the entire temple reverberated with pure, divine energy. A truly profound experience. After pujan, mumukshus headed to the nearby Trailinga Swami Math (Ashram). Trailinga Swami, was a Hindu Saint from Benares recognised as an Avadhuta, a great Saint, by Ramakrishna, Yogananda, and other Saints of his time. Referred to as the “The walking Lord Shiva of Varanasi”, he was believed to live for around 280 years, 150 of which residing in Varanasi. Ramakrishna had said that Trailinga Swami had exalted state of knowledge, and no body-consciousness, a real paramahansa ("Supreme swan") illuminating Benares. The day started with visit to Shankeshwar Parshavanath Shwetambar Tirth in Bhelupur. 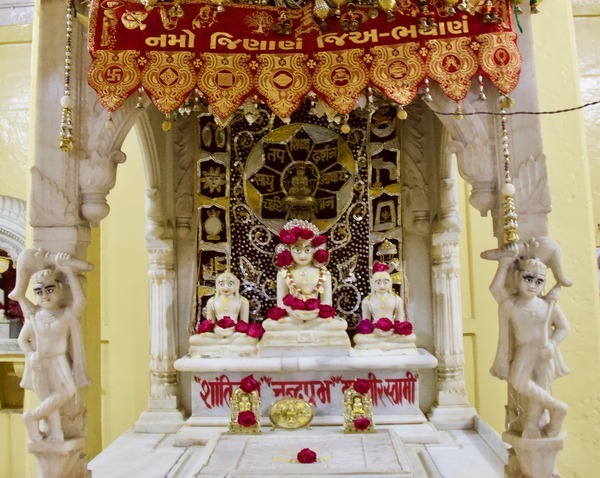 Located in south of Varanasi town, Bhelupur Jain Tirth is dedicated to Lord Parshwanath where 4 kalyanaks are located. A charan paduka (a sacred rock having the foot impressions) of Bhagwan have been installed to mark the sacred spot. Mumukshus had opportunity for seva puja, darshan and chaityavandan with Bhaishree. 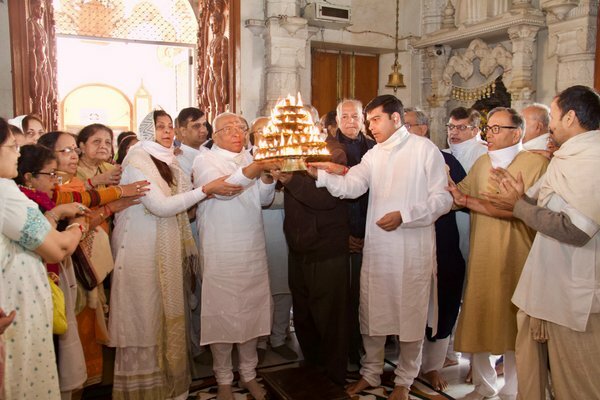 In the afternoon, yatris visited the famous Kashi Vishwanath temple, also known as the Golden Temple, due to the massive gold plated dome on 15.5 meter high spires, dedicated to Lord Shiva. 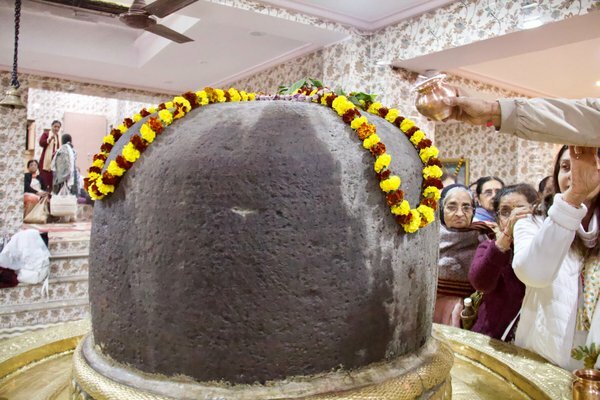 Revered Hindu pilgrimage site, the Temple enshrines one of the 12 jyotirlingams of Lord Shiva. Shiv devotees believe one who prays and worships Vishweshwar, the “Lord of All”, with devotion will attain liberation. 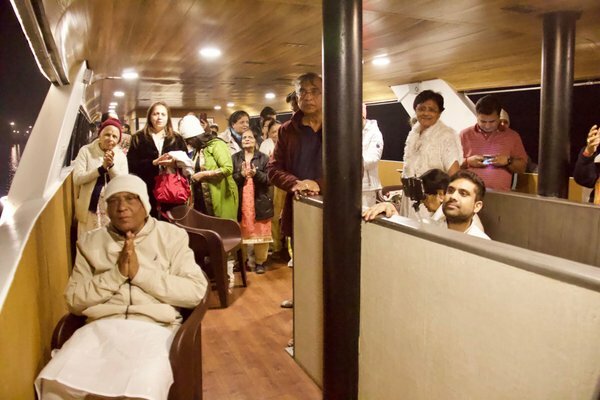 An amazing Ganga Aarti cruise was organised for the evening. 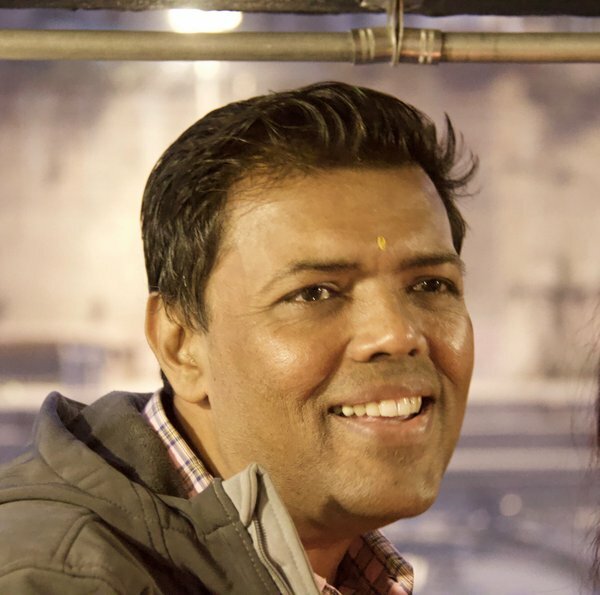 Mumukshus boarded the boat from Assi Ghat, the southernmost Ghat in Varanasi. Hindus believe that it was at Assi Ghat that saint Tulsidas left for his heavenly abode. 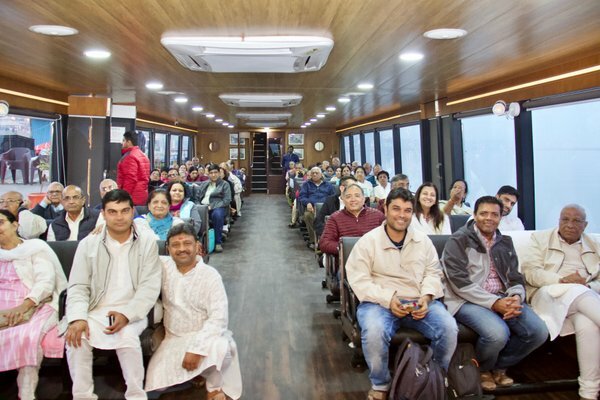 The cruise enabled a beautiful view of the sunset, with its hues adding a delicate tint to the river, as well as the opportunity to witness, from the boat, the Ganga Aarti – a daily ritual of offering devotion to the holy river Ganga – held at several ghats almost simultaneously. The entire experience was simply divine, just magical. “Ganges gives nourishment and life to all beings from one sensed to five sensed. We are indebted to the Ganges for inspiring spirituality to so many people and we see them doing aarti with so much ‘bhaav’. This devout aarti looks much more stunning from the river than from the ghat. The Ganges is such that it takes peoples’ dirt and sinks it into the ground and in return gives them it’s pure water. We should take inspiration from Mother Ganga, it is our duty to strive hard to progress on our spiritual path and for inner purity. We should have unshakable faith and devotion for the path given to us. Mumukshus returned to the hotel feeling exhilarated. Morning visit to Bhadaini Tirth, also known as Jain Ghat, home of Suparshwanath Bhagwan’s 4 kalyanaks. After puja and chaityavandan mumukshus settled down on the terrace for Bhaishree’s swadhyay. Bhaishree reminded mumukshus of their good fortune, to be able able to be present on bhumi of 4 kalyanaks of Tirthankar Bhagwan. He then explained the Suparshvanath Bhagwan stavan by Devchandraji Maharajsaheb. Devchandraji described Suparshavnath Bhagwan as ‘Avyabadh sukh na Swami’ (Master of unimpeded happiness). For a striving sadhak, observation of such “sukh”, would trigger within him, a desire to awaken the same sukh (eternal bliss) that is dormant within him. Sarnath is a sacred pilgrimage site for Buddhists and Jain devotees alike. It is an immensely important Buddhist pilgrimage site. It is also referred to as Isipatana, a city mentioned by the Buddha as one of the four places of pilgrimage which his devout followers should visit. After enlightenment in Bodh Gaya (528 BCE), Buddha traveled to Sarnath. Delivered his first sermon to his 5 disciples teaching the “four noble truths” and setting in motion “The Wheel of Dharma”. Emperor Ashoka had also erected magnificent stupas and monasteries and engraved pillar here, in 3rd century BC. Referred to as Thai Temple, the Hinayana Buddha temple built in 1933, is located amid lush and manicured gardens. There is a statue of a laughing Buddha just before the main Thai temple and on the right side is an enactment of Buddha delivering a sermon to his disciples. There are other statues of Buddha in various mudras. Birthplace of Shreyasnath Bhagwan and home for 4 kalyanak (Chyavan, Janma, Diksha and Kevalgnan). 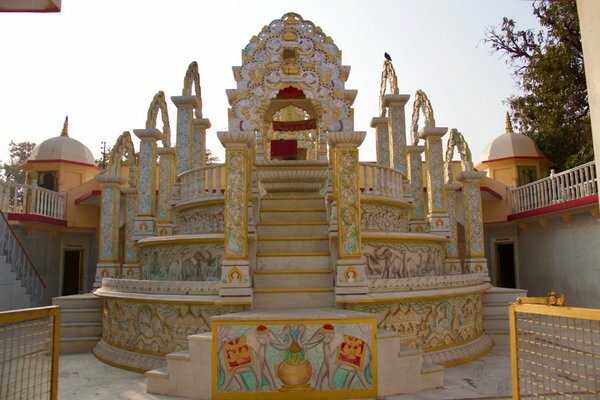 A beautiful temple complex with a Samavasaran with paduka of Bhagwan at the top. Onwards to Chandrapuri Tirth, birthplace of Shree Chandraprabhu Swami and home for his 4 kalyanak (Chyavan, Janma, Diksha and Kevalgnan). Day spent travelling from Varanasi to Ayodhya. 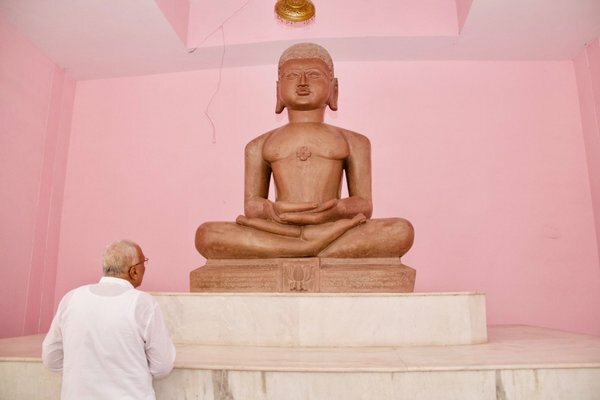 Important pilgrimage center for Hindus, Jains & Buddhists, alike. Name derived from Sanskrit ‘A’ and ‘Yudha’, meaning place of no conflict; the invincible, “one which cannot be conquered by vices”. River Saryu, that flows through Ayodhya, has been a silent witness to great personalities that once walked the earth here. Besides association with Hindu mythology, Ayodhya has also nurtured spiritual values from Jainism. 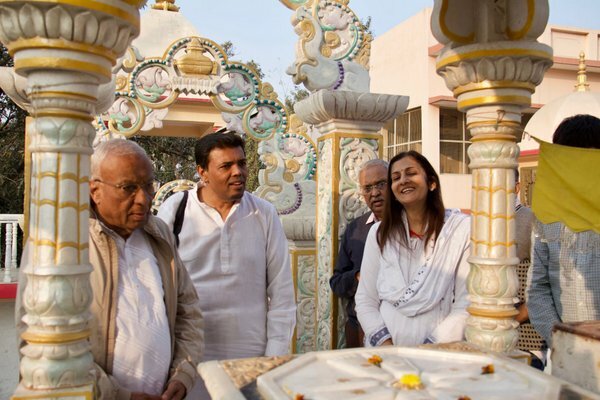 It is place where five Tirthankars, were born and preached the profound Jain values and is home for 19 kalyanaks. Bhagwan Mahavir and Gautam Buddha too had visited this pious city many times. Early evening arrival for a night stop at the Dharamshala within Derasar campus. Derasar is located in Katara mohalla near banks of Sarayu & Ghaghara rivers. Evening spent with aarti and mangal divo at the temple, presiding deity Ajitnath Bhagwan in copper colour, and visits to Shri Digamber Jain Derasar and to Kanak Bhavan. The Derasar has a beautiful chaumukhi (idol facing in all 4 directions) within shikharbandi stupa. The 4 Kalnayaks of Bhagwan Dharamnath (Chyavan, Janma, Diksha and Keval Gnan) took place here. Four corners of the temple compound are anchored by Shree Dharmanath Bhagwan’s 4 Kalyanak Mandirs. The temple is mentioned in Acharya Shri Jinprabhusurishwarji’s book, " Vivid teerth Kalp" written in fourteenth century of Vikram Samvat. The ancient temple is associated with number of miraculous stories. Temple pujari talked about sound of temple bells ringing in the night and of saffron rain falls. Stains, dried droplets of a recent rainfall were visible on temple campus paving. 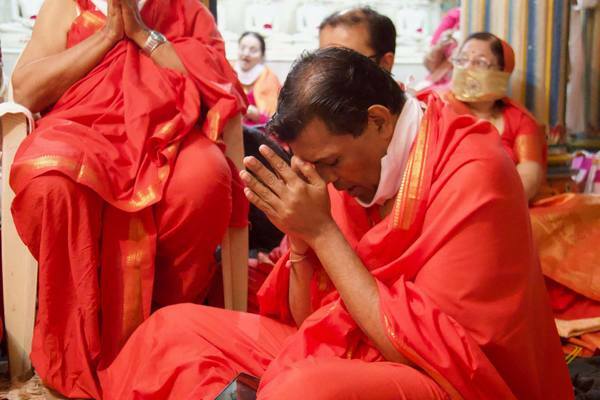 After seva puja & darshan, yatris settled down, mumuksus at the ground level, and Bhaishree, Brahmnishts Minalben and Vikrambhai up above near mandir doorway, to revere the Lord with bhaav pujan (chaityavandan), stavans and garbas. After lunch at Ratnapuri, the sangh proceeded towards Shravasthi, to Sravasti Tirth. A sacred historic place celebrating 4 Kalyanak of Bhagwan Sambhavnath, (Chyavan, Janm, Diksha and Keval Gnan). 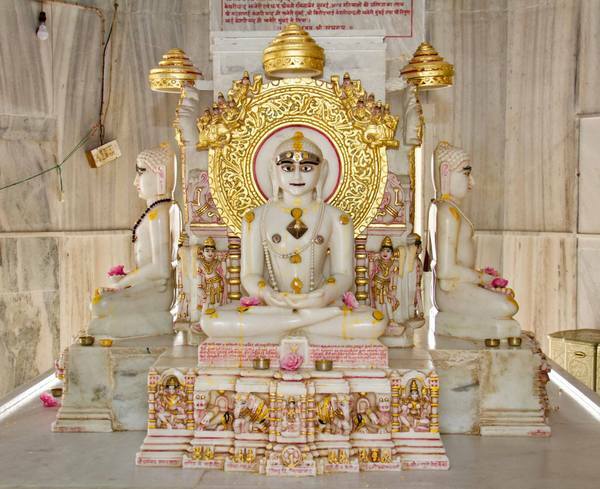 A beautiful Derasar of white marble, with a white pratimaji of Sambhavnath in padmasan posture. Shantinath Prabhu had also visited Shravasti and Mahavir Swami had spent several chaturmas here with Samosaran erected for Him on number of occasions. First meeting between Keshi Muni and Gautam Swamiji occurred here. Goshala had struck Mahavir here with tejoleshya (lightening ray produced out of his body). After aarti and mangal divo mumukshus retired for evening at the hotel. In the morning mumukshus gathered at the Derasar for final seva, puja, darshan and chaityavandan. And thus ends, a spiritually divine jatra. 9 days spent in presence of Param Pujya Bhaishree on the revered bhumi of the Tirthankars, enabling a unique opportunity for spiritual development, steadiness of mind, meditation and eternal peace.